Smartphones have become such a significant part of our lives that it makes sense to incorporate smartphone technology within pet gear products to give worrisome pet owners the peace of mind that they deserve. A majority of pet owners nowadays all have at least one pet feeder at home, but now you’re in for a surprise since you’ve never seen a pet feeder like the one that came from the design labs over at Feed and Go. Pet feeders have been available to consumers for several decades, but within that time span, no new technology was introduced to the pet feeder market. Feed and Go developed as a response to a technologically lacking pet gear industry, so it produced a high-tech version of traditional pet feeders that go by the name of Feed and Go Automatic Cat Feeder. Keep reading for an in-depth review of Feed and Go Automatic Cat Feeder. 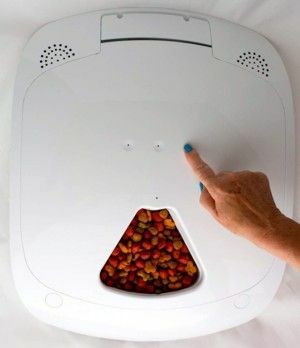 In regards to age groups, Feed and Go Automatic Cat Feeder is a hit amongst young adults since their lives revolve around smartphone technology. Even if you're not comfortable using this technology, you can quickly learn and enjoy the benefits it has to offer for both you and your cat. Who Is Feed And Go? All it took was the combined mental acuity of a couple who are proud owners of three pets to result in the creation of Feed and Go. Simply put, Feed and Go was a response to the severely lacking pet feeder market that wouldn’t cater to this couple’s needs. The best way to address the problem is to take matters into your own hands, which is what Feed and Go essentially stands for. This pet loving couple pinpointed three features that would enhance the overall build of generic pet feeders, and these elements included combining technology with practicality but without forgetting about an aesthetically pleasing design. 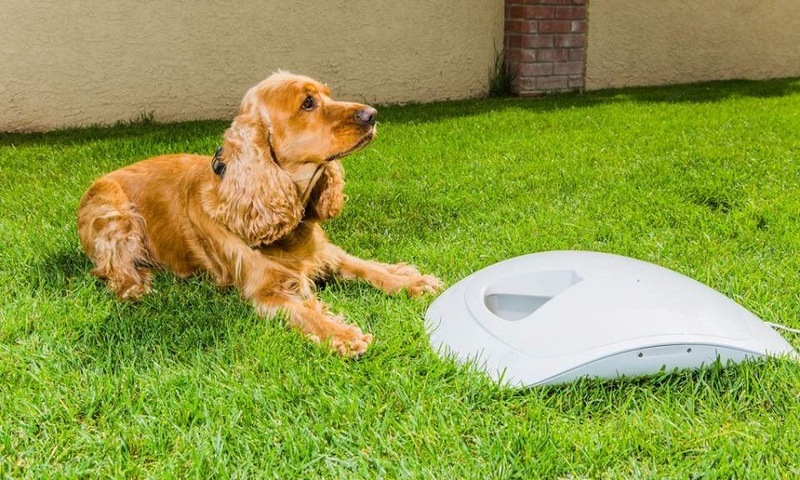 After four years of research and neverending prototypes, Feed and Go made its mark in the pet gear industry by producing a product that relied on technology no one ever thought to include within the build of a pet feeder. To this day, the man and woman responsible for the birth of Feed and Go still solely rely on the pet feeder products that come from their own factories. 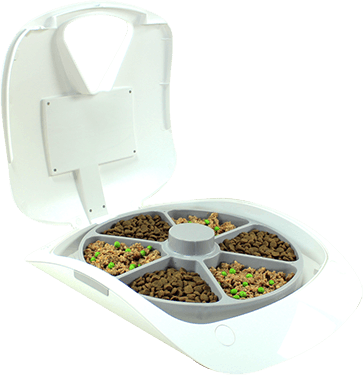 Feed and Go Automatic Cat Feeder is a prime example of how practical, smart technology people typically take for granted can be applied to other products in various markets. Thankfully, the couple behind Feed and Go saw the potential of smartphone technology and revolutionized the pet feeder market as a result. If you are prone to experiencing separation anxiety as a result of having to leave your pet alone, the IOS or Andriod application that works collectively with Feed and Go Automatic Cat Feeder is the answer you’ve been looking for. In fact, a majority of buyers who claimed to suffer from separation anxiety noticed their panic attacks getting less and less prominent after using Feed and Go Automatic Cat Feeder. While you're at work, you shouldn't worry about your cat. Those who continuously fret end up fervently using the Feed and Go app to check up on their pets. The five-second check up on your cat's well-being has proven to provide therapeutic effects that reduce high levels of anxiety. Buyers rave about the efforts Feed and Go persisted through to release the new and improved 2018 Feed and Go Automatic Cat Feeder model. When people complain, Feed and Go listens, so it's no surprise that all the smartphone features built-in Feed and Go Automatic Cat Feeder is merely Feed and Go's response to those complaints. Based on positive buyer reviews, those who tend to embrace the convenience technology has to offer will greatly appreciate the smart technology incorporated into the overall design of Feed and Go Automatic Cat Feeder. High-quality pet products such as Feed and Go Automatic Cat Feeder will improve your pet's well-being in the long run, which has a more permanent effect on your pet's health than monthly routine checkups at the veterinarian. For a lot of buyers, fewer visits to the veterinarian are good news since now you have additional disposable income that you have the option to spend on high-grade pet gear. Some buyers did offer a couple of tips that are worth mentioning, and it’s strongly advised to adhere to these precautions so you can make the most out of Feed and Go Automatic Cat Feeder. If you have more than one cat, you can utilize the same Feed and Go Automatic Cat Feeder for both pets. Be wary of sharing feeders since the only way both cats can coexist and share the same bowl is if they’re consuming identical food. Having a pet with specific diet restrictions will require you to buy a separate Feed and Go Automatic Cat Feeder to accommodate to each pet’s dietary needs. Unfortunately, having more than one cat can prove to more of an expense on your part than you initially assumed it would be. Thankfully, when you pair the high-tech build of Feed and Go Automatic Cat Feeder with smartphone technology, you're left with a device that you can control from miles away. Every pet owner's dream is having ultimate control over when your pet eats, and this rings even truer when you're not at home. On top of being able to control what your pet eats while you’re spending your day at work, you can use the very same smartphone application to create profiles unique to your particular pet. Thi means Feed and Go Automatic Cat Feeder permits you to switch between pet dietary profiles, so everyone’s needs are met. After thoroughly searching for an online retailer that offers the best value deal for a Feed and Go Automatic Cat Feeder, you don’t have to look any further since Amazon proved to surpass all the competition with flying colors. In fact, Amazon ensures at least a 25% discount off of Feed and Go Automatic Cat Feeder's original price, which was already steep enough, to begin with. For under $150, smart technology can have more of a positive effect on both you and your cat's health, and all that's required on your end is to incorporate Feed and Go Automatic Cat Feeder to your household. This automatic pet feeder takes advantage of the convenience that smart technology has to offer, but takes it up a notch since it applies the technology to function under more practical situations that fortunately both you and your pet will benefit from. I would highly recommend buying Feed and Go Automatic Cat Feeder especially if your smartphone is a necessary part of your life.